Introducing HairStem Kit Product System for hair loss and Advanced Hair Regrowth. The HairStem Product System is first Hair Regrowth Product Kit that uses 5 different therapies to truly achieve more hair. 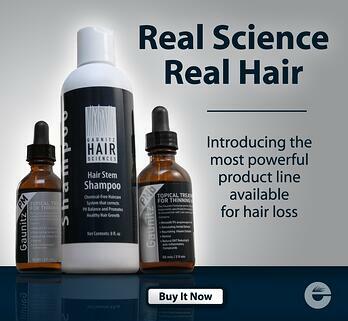 Gaunitz Hair Sciences has used clinical research to develop a product set that will truly stimulate new hair growth and successfully treat hair loss. This system is the first to treat all primary reasons for hair loss such as DHT, Excessive Inflammation, Excessive Toxicity, Bacterial Infection, Lack of Nutrition and Decreased Scalp Blood Flow. "I had serious scalp itching and dryness. I was allergic to Rogaine, but I tried the HairStem Kit because it was OK for sensitive scalps. After 3 weeks my itching was completely gone. By week 7, I saw little new hairs on my frontal hair line. I love this product so far!" "I tried Ovation Hair Products and was very disappointed. I read the blog article William Gaunitz wrote about this new product. I decided to try it based upon the good results others in the blogs were getting. I am glad I did. I had been shedding nonstop for 5 years and my hair was getting thinner and thinner. After 8 weeks on the Hair Stem Kit, my shedding has stopped and my scalp no longer feels tight and itchy. Excellent results." "The HairStem Products have been a Godsend! My brother had a hair transplant and it looked terrible afterward. I was determined not end up like him. I did a ton a research on the blogs and discovered the Hairstem Product Kit. It was pretty simple with only having to put product on at night. I did not want to use anything in the morning that may make my hair look thinner. After 10 days, my hair loss stopped. I mean stopped totally. No more hair loss in the shower. I was so excited, bought a kit for my brother." "Some many kits and products… I have tried everything. I continued my search because I kept trying products only to have them stop working after a couple months. I tried the HairStem Kit only because it was a special I found after doing research on a hair loss forum. I followed the instructions to the T. I honestly thought that this one was going to be a bust as well… but after 4 weeks my hair loss stopped and I began to see a little more growth on top. I could not believe at first how well it actually worked. 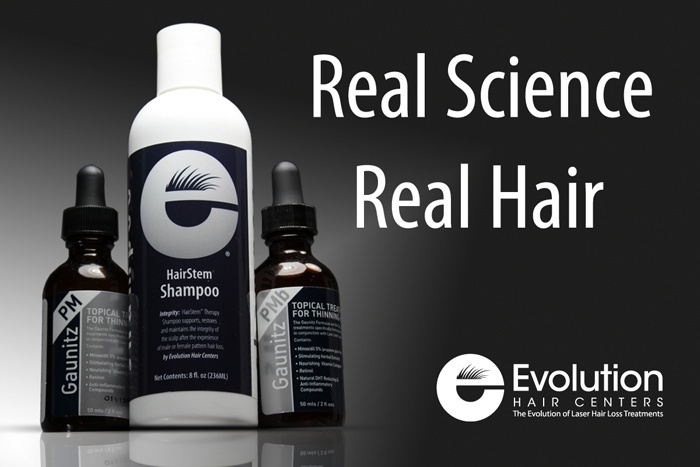 I actually then looked into Evolution Hair Centers more and found that their clinics are actually doing some pretty amazing things with combination products. I am not ready for their clinics, but I am really happy with their product. Sincerely Jim, Satisfied customer." HairStem Product System is a completely specialized formula containing Minoxidil compounded with natural topical anti-inflammatories. Due to Minoxidil’s vasodilatation properties, it is a perfect enhancement to powerful herbal therapies. Minoxidil is responsible for expanding and reinforcing blood vessels/ capillaries that feed the hair follicle. When elevated blood nutrients levels feed the scalp, the effected hair follicles are forced into the growth phase leading to longer thicker hair growth. This will create a minor increase in hair density and will act as a substantially better starting point for other specific herbs and vitamins to work more effectively. When the hair follicle is already in the growth phase, herbs like High Polyphenol Green Tea Extract and vitamin like Panthenol will be able to add its benefits on top of the benefits from Minoxidil. This actually creates a multiplying effect to each product so that you can get 4 times the result of using these products or Minoxidil alone. Other topical ingredients can further enhance treatment for male and female pattern hair loss suffers. These following ingredients can improve results by another multiplier by addressing other reasons for hair loss (i.e. DHT and inflammation caused irregular sebum production). Azelaic Acid-is useful as a hair growth stimulant. A research report by Stamatiadis in 1988 suggested that azelaic acid (and combinations of it, with zinc ion and vitamin B6) was a strong DHT inhibitor. Di-hydro-testosterone or DHT has been found to be the cause of male and female pattern hair loss. Retinoic Acid- also called tretinoin, is the acidified form of vitamin A. Retinoic acid is used to remove fine skin wrinkles and roughness. It works as a natural chemical peel, enabling better penetration of Minoxidil into the scalp and speeding the cell regeneration process. Licorice Root Extract- Licorice is used to treat general skin problems. It is known to be healing and soothing to dry and irritated skin. It is particularly used as facial oil for acne to expedite healing. Licorice root is also another herb that prevents hair loss and further damage to the hair. B5 (Panthenol)- is the only vitamin (Vitamin B5) known to penetrate the hair shaft. It has historically been used to build healthy follicles and reduce graying. Aloe- Aloe Vera Gel is rich in mucupolysaccharides which provide a natural and anti-inflammatory effect. Gaunitz Hair Sciences PM and PMb Topical Formulas contain an FDA approved pharmaceutical proven to regrow hair. GHS has packaged the above ingredients into two different formulas that are to be alternated nightly. With once daily applications of Gaunitz Hair Sciences PM or PMb formulas, you greatly enhance the benefit of hair loss treatments. Inactive ingredients: Aloe gel, Licorice Extract, B5 (panthenol), B6, High Polyphenol Caffeinated Green Tea Extract, Glycerin, Alcohol. Directions: Best if used at night, two hours prior to bed. The PM Formula is to be alternated nightly with the GHS PMb Formula..
Inactive ingredients: Aloe gel, Licorice Extract, B5 (panthenol), B6, High Polyphenol Caffeinated Green Tea Extract, Tea Tree Oil, Glycerin, Alcohol. Directions: Best if used at night, two hours prior to bed. The PMb Formula is to be alternated nightly with the GHS PM Formula. A daily moisturizing chemical free anti-bacterial shampoo that adds shine and keeps the scalp clean and healthy. Active ingredients include Ginger Extract, Lemon Grass Extract, Peppermint Oil, and Grape Seed Extract. *Essential for healthy hair regrowth as well as post-hair transplant surgery or chemo therapy. If you are not happy with the HairStem Kit by Evolution Hair Loss Institute after 45 days, send back the unused portion of the product and receive a full refund - minus Shipping and Processing*. * Shipping and Processing fee is based upon your initial purchase. The actual shipping cost plus $15 processing fee will be subtracted from the refund amount. Refund check will be issued within 6-8 weeks of receipt of unused product. Client must email elizabeth@hairgrowthcenters.com prior to sending the unused product to receive the return code. Client must ship back product at their own postmarked on or before the 45th day after purchase of product.